Windows® XP is no longer supported! 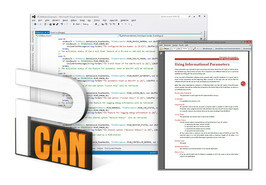 The PCAN-Basic API (application programming interface) allows easy development of powerful software with CAN and CAN FD support. It includes all of the functions that an application needs in order to communicate with PCAN PC hardware. The cross-operating-system design makes it possible to easily port software projects between platforms. PCAN-Basic consists of the actual device driver and an interface DLL, which provides the API functions. As the successor to PCAN-Light, PCAN-Basic offers increased functionality and extended language support. It provides various functions for developers under C++, C#, C++/CLR, Delphi, VB.NET, Java, and Python 2.x. Beginning with version 4, PCAN-Basic for Windows® supports the new CAN FD standard (CAN with Flexible Data rate) which is primarily characterized by a higher bandwidth for data transfer. Note: PCAN-Basic for Windows® CE does not support the new CAN FD standard. PEAK-System provides the PCAN-Basic API to allow the development of your own CAN applications for Windows® CE 6.x. Programmers can use the languages C++, C#, and VB.NET. PEAK-System provides the PCAN-Basic API to allow the development of your own CAN applications for Linux. Programmers can use the languages C++, Java, and Python 2.x. Note: Parallel port CAN interfaces are only supported on 32-bit systems.